For increased productivity and profitability. Our performance agreements include scalable services to improve all business processes in your company. Predictive monitoring agreements - Higher availability thanks to predictive service. With a Predictive Monitoring agreement, your machines are permanently monitored and possible future errors avoided. 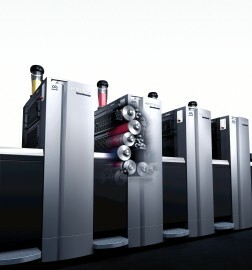 You are regularly informed about your equipment’s condition in general and the predictive measures taken by Heidelberg SystemService. To ensure maximum availability of your machines, our Predictive Monitoring agreements can be included within a full-service agreement. Application Agreements - For greater color stability and sustainability. Our application agreements are especially geared for customers specialized in demanding jobs requiring top quality in print production. Services include: print color management as well as to our ISO 12647-2 certification. Consulting Contracts - for maximum efficiency in the entire print shop. With our basis Consulting program, you receive a regular analysis of your production processes and a list of recommendations for improvement. At your request, we can work together with your team to define the scope of your individual improvement program. We accompany you every step of the way to ensure the maximum performance of your overall print shop in the long run.